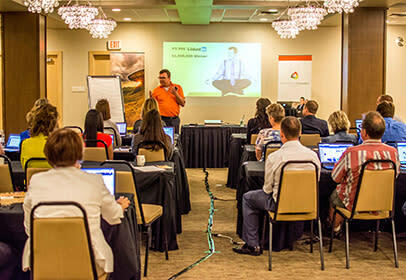 July 6th saw Tourism Kamloops and the Kamloops Chamber of Commerce team up to bring to their members the workshop: Networking Like a Ninja with Craig Elias held at the DoubleTree by Hilton. With over 20 people registered for the workshop – the morning session saw attendees learning the six keys to getting connected, how to avoid the most common networking mistakes, how to enter and exit conversations with ease, how to get more business from networking, and how to get the most out of your LinkedIn profile in order to enhance and increase your online presence and networking skills. After lunch attendees signed up for the opportunity to have a professional headshot taken with Tourism Kamloops’ own Mary Putnam, and enjoyed a more in depth look at their own LinkedIn profiles as volunteered profiles were brought up for the group to discuss what was done well, what needed work and why. Keep your eyes open for the next workshop from Tourism Kamloops!